Paul Pollock secured his European Cross Country spot by placing third at the Irish Championships but Ciara Mageean dropped out of the women's race. Mick Clohisey won the men's event at Santry from John Coghlan and Pollock. Twice European Cross Country champion Fionnuala McCormack won the women's title ahead of Lizzie Lee and Caroline Crowley, with Kerry O'Flaherty fourth. Mageean, who had been fancied to challenge Britton, dropped out during the final lap. 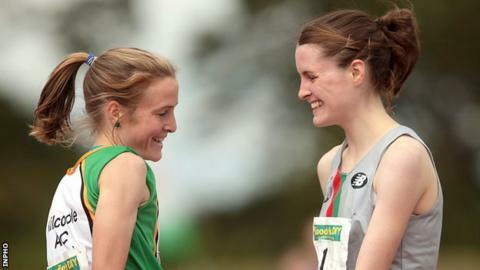 Portaferry runner Mageean finished the summer track season in impressive fashion as she improved her Northern Ireland 1500m record to 4:06.49 in Rieti - which was only .49 of a second outside the Rio Olympics qualifying standard. The county Down woman challenged McCormack over the opening two laps but had dropped down to eighth spot on the final circuit when she pulled out. In contrast, Olympic Games-bound O'Flaherty produced a strong finish to her race as she moved up to fourth spot to book her place at the European tests in the French town of Hyeres on 13 December. "I've done about 48 hours of travelling before today," revealed O'Flaherty, whose car broke down during her return from a training stint in France. "Fionnuala was away training with us in Font Romeu and we had a great camp, I think we'll go very close to a medal at the European's next month." Holywood runner Pollock won the Irish European trials 12 months ago but was content with his third placing behind fellow marathon man Clohisey. "I wasn't all that fit coming here and my aim was to make the team for the European Cross Country," said the 29-year-old, who was 60 seconds behind the winner. "It's been a great day today and I think I will race well in France in a few weeks." Runner-up Coghlan is the son of Irish athletics legend Eamonn Coghlan, who career was highlighted by his world 5,000m triumph in Helsinki in 1983. Banbridge athlete Emma Mitchell booked her spot at the European Championships by finishing second in the women's under-23 race behind Shona Heaslip.